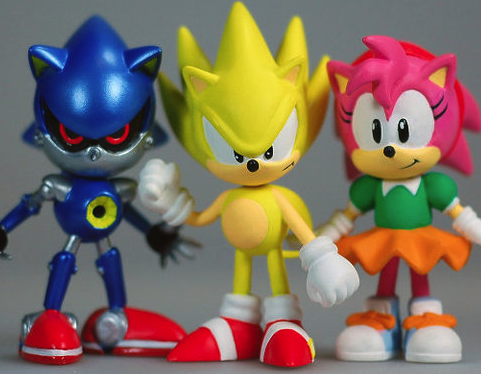 This morning, First 4 Figures unveiled its next line of 2-inch Sonic figures. As seen above and in our gallery below, three more figures will be produced and will be available in stores soon–Metal Sonic, Super Sonic, and Amy Rose. What’s more, F4F will be bundling this series with the first run of Sonic, Tails, and Knuckles in a six pack which will also hit stores soon. The exact shipping date and price points were not immediately available, though we’ll let you know when they do. Most attendees of London’s Summer of Sonic convention will grab the Metal Sonic 2 inch figure first. As part of the company’s SoS sponsorship, the first 750 people in the door will receive Metal Sonic. All attendees will be entered into a raffle to win the Super Sonic Exclusive figurine we told you about in June. Get a good look at the figures F4F showed off on their Facebook page via the gallery below.